In June, I started to use a poster from a classic Sci-Fi move as the background for the post image. 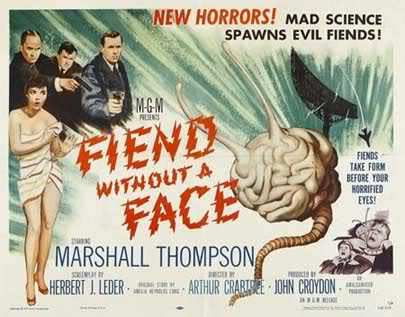 This month it is from Fiend Without a Face (1958) and it’s so funny to see what scared people back then. I’m sure we will look back on what we think of as scary in a twenty years and laugh at that. Here’s an interesting mod based off Silent Hill. It currently has a demo out. Also, here’s an alt mod with a beta out. It’s apparently being rebooted and is not dead, as said by the author about a week and a half ago. have a great holiday phillip … good to hear your in the uk … anywhere nice … dont come up north,its been pouring with rain for the last 3 days ( and i mean heavy rain ) ..
looking forward to sniperville … this has loads of potential …lets hope the regular mappers get their thinking hats on and produce some amazing maps …. anyway enjoy yourself mate ! I also really like the idea of SniperVille2, it seems that when the first SniperVille was made, people weren’t quite used to using Ep2’s assets, a lot of its maps look more like vanilla HL2, moreso than the later Villes. Well, it’s interesting to see the people who entered the competitions at the beginning an the new people. There seems to be a steady flow. Might be interesting to make a table. hank you very much. I’m having a great time already. Sorry if it’s already been posted, it’s a critical look at the architecture in the HL2 levels, with some interesting points about sewers and city planning. Wow…..I found this SFM video that would make a really great Half Life 2 mod. It shows the possibility of the Combine having hearts. Which ones should I keep for the last? Any favorites on the list? Or much more important: Anything good from the last month that I missed? I also wanted to add one more thing: I don’t post very often on here but just wanted to thank you for hosting the site and curating all the maps and stuff. As someone who has also done quite a bit of mapmaking I love going to this site and checking out the awesome new content. Without PlanetPfillip I would really be missing something. PS: What about this video: Portal 2 Coop Speedrun in ~ 25 min. Hope you are having a good holiday in London, especially at this historically significant time. If you go anywhere near the Tower of London go and have a look at the moat which you may by now have seen on the news, I was one of the volunteers responsible for planting the ceramic Poppies that are there now. Oooh, and look at this, brand-new Hammer Editor! Oh God, look at all the goodness… Realtime lighting, set custom rotation pivot, tile editor, populate with assets (props I guess)… We MUST find a way to get this working with HL2!! God dammit, give us Half Life 3 already! Now here’s the real question. How many people have downloaded DOTA2 just so they could tinker with the new tools? Hope you are enjoying your holiday, Phillip! The map was made in two days, and its far from complete. I just want to know if there is something I should change before continuing with details etc. I prefer if you give the feedback in comments on the post where you can download the map file. Something weird is going on, yesterday on starting Steam I had lost all my HL games, 1 & 2, the Episodes, Op4, BS and CSS… The mods were all still there, but wouldn’t run without my downloading HL2 again…. Now I might be a bit slack at times, but there’s no way I accidentally deleted all my games…..
Disclaimer: I did not make this, just sharing something I found that I thought was funny. I make no guarantees as to its accuracy. I know this is mod freakin related BUT I HAVE TO ASK!! DOES PP.com gonna host The Gate 2 mod???? I hope so we can review it and speak our mind about it. I just looked at the ModDB page about it. Yikes. I mean, I don’t want to be too harsh to someone who probably spent many hours building this, but people like this have no business making such long mods if they don’t know a basic thing about aesthetics or quality gameplay. At least, that’s my opinion. Also, he apparently swiped a lot of assets from other games, which is a huge no-no in my book. Well, JG. I’ve already downloaded the mod, and I haven’t play it yet, so I can’t actually form an opinion or a prejudgment until I put my hands on it. 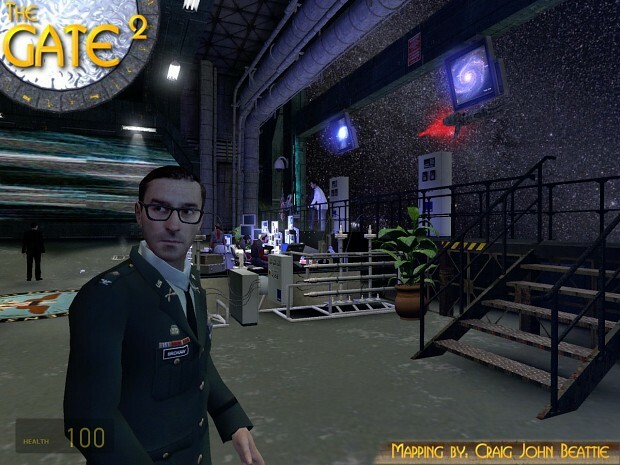 So I really can not tell you if it’s a lousy mod, in my opinion The Gate 1 for HL1 was a very cool mod, sure had its glitches and down points but to me it is a classic TC mod, I don’t know if this mod is as good as the first one, but sure I’m gonna try it. As for the swiped assets from another games or mods, well I really think if the author used some stuff from other mods he should recognize their original creators in the credits of his mod, yeah is kind of weird because I’ve seen a guy with glasses in a TG2 picture from mod DB, that looks a hell lot like a character from the Underhell mod, so it looks like rip off but I can’t assure that neither. Here’s the guy/character in the gate 2. And Matthew Porter is the character in Underhell, that looks a lot like this TG2 guy. Between mods, if you get permission and give credit, it’s fine. But you’ll never get it from a typical game developer. Even Valve forbids modders from distributing assets between their games (i.e. using L4D models in HL2). It’s just one of those things that irks me. Both because it’s technically illegal and because it rarely makes any aesthetic sense. People on ModDB eat it up because they love seeing anything that looks new. Similarly, the game blogs love mods that rip off the textures and models from other games (i.e. “OMG, it’s [a popular game franchise] in Half-Life!”). Those mods get all the attention while works that demonstrate actual creativity, like Research & Development, get comparatively little exposure. Geesh!!! You are a million percent right Mr. JG!! And I can tell you I’ve already played the first 35 min of that mod and are absolutely horrid!!! No new custom weapons basically you get the old classic Hl2 guns which is kind obnoxious, a helicopter totally stollen from L4D, using of Alyx’s model as an “own carachter”, many content stolen from the great Underhell mod, content stolen from a Mp mod called: resistance and liberation, and i think I even saw some car-truck models designed for some Grand Tefth Auto game in this mod!!!!!!! I freakin can’t believe it!!! Also the whole game have a horrendous pace and we can see beta testing was not efective at all, as many people complain about the greatest dificulty in the first 3 maps of the mod that offers a buggy ride!! God. Is this is probably the worst release of an awaited mod??? In my opinion yes. I guess is one of the worst releases ever made. So it’s a proper sequel to The Gate. Yeah but at least The Gate 1 was better in almost all senses. I have found this old article from a developer who works at Frictional Games (creators of Penumbra, Amnesia and the upcoming Soma) about “unconventional game design”. Of course, the article is intended to address the entirety of the game creation process, but reading it I noticed that a lot of things could also be applied to mapping and level design alone. It’s a really interesting read from the point of view of a mapper, so I’ll link it here in case anyone else is interested. I finished Half-Life 1. Go me. I liked chapters such as Blast Pit, Questionable Ethics and Lambda Core. They all have a few things in common – compact layouts with a bit of backtracking and a strongly focused goal. I tended to feel there were too many different weapons in the game and it’s easy to see why HL2 pared it down a bit. The chapter I liked least was Residue Processing because it was mostly timing and platforming and didn’t feel like it “fit” the style of the game, but there were wide swaths of Surface Tension that I thought were too ambitious for their own good. Xen didn’t bother me nearly as much as I thought it would, but I don’t think very highly of it either. A lot of people talk about how the HECU was so much better than the Combine. I think it has more to do with the somewhat open-ended arena layouts (especially the setpieces in Power Up and Questionable Ethics) which gave the AI a lot of options to work with. When set up correctly (i.e. with standoffs), the Combine can do similar things. On their own, the only thing that makes the HECU a bit different is their tendency to run away when heavily damaged, which is both a good thing and a bad thing. It’s good because it looks like the smart thing to do, but it’s bad in the sense that it can make a battle flow outside the intended combat space. Concerning the setting, Black Mesa is a sprawling, gelatinous blob of corridors and labs that rarely feel like they serve any purpose in the greater whole. In a game like System Shock 2, you can reason why all of these locations exist in a starship. The bridge, living quarters, hydroponics, recreation deck and so on. I never got that sense with Black Mesa, let alone the fact that it’s all underground. As much as I like the concept of Black Mesa, it doesn’t feel that “authentic” to me as a location because it lacks those thematic elements. I think the gravitas of the situation does occur in hindsight when you realize in Half-Life 2 that Black Mesa screwed up the entire world and you were there when it all went down. You see a general lack of hubris with the scientists, even after the disaster, which is sort of mirrored by Kleiner’s zeal toward the Borealis. And when the government starts bombing the hell out of Black Mesa – it’s kind of a joke at that point. All they care about is the short-term cover-up and yet the world as we know it is about to end. It’s also interesting how Valve chose Freeman as the one who inserts the sample. Freeman isn’t just a survivor – he’s also the one who started this whole chain of events in motion. I’ve always found the deification of Freeman in Half-Life 2 to be a fascinating subject, because his actions don’t really justify it. Even if he blew up the Citadel, he also wiped out all of City 17 and everyone who didn’t escape (I don’t buy that “everyone escaped” at the end of Episode One – that’s way too convenient). He would have made a lot of enemies along the way. It’s been a plot point I’ve wanted to explore. I’m happy to have finished it many years after the fact, but I can’t say I’m ready to rush right into Opposing Force or Blue Shift. I always wonder why they needed Gordon to insert the crystal, couldn’t it be mechanised? You wouldn’t need to pay anyone to do it and give them all the fancy HEV stuff, the electrician who fitted that button on the platform in C-33/a is a cowboy joe prune, he could have routed it into that room where the dudes get blown up by the green beam then jobs a gooden. Paying the guy all that money to just push a cart a few meters! What a waste of human resources Black Mesa, they should be ashamed, look at Aperture, they don’t need to pay anyone there. Pretty cool video showing the controls of Half-Life 2 (VR mod) using an Oculus Rift and Hydra controllers. Once polished it seems like a cool (expensive) new way to play your favorite games. Not sure I’d use it for most games, though. Yes, it is interesting, but I’m really not sure I want to control the game with my movements. That said, I won’t be able to avoid the hardware anyway. I’d say it looks ok. I’m gonna play it definitely sometime soon. I just played it. It’s competently made, but I can’t say it was particularly fun. The gameplay is mostly running around looking for keys in small cluttered rooms. I have received an email from a Linux Lover, from now on known as LL and he asked about using mods in Linux. I have no experience with Linux and am hoping you can help. So, what’s the state of play with using mods on Linux? I recently stumbled upon ‘Paranoia, The Game’ for HL (1)…a total conversion. It looks ok having played 20 mins or so of it, but one thing is really bugging me, there appears to be no way to configure the movement controls and console. Now that may be just me, but I did try to alter the config file with notepad, to no avail. I’m running win 8.1, if that makes a difference, it’s not as gamer friendly as XP was, which it says the game runs best on, it shouldn’t make that much difference though, if it runs, it runs. The options are all there on screen…it just takes no notice of my input. Has anyone else played this, had the same problem or know a fix ? I wouldn’t bother about it if it looked rubbish, but it actually looks good. I have not tried Paranoia (on the list), but you can try putting your keybinds in userconfig.cfg instead of config.cfg assuming that is the one you tried. Config.cfg can be overwritten so custom binds are better in userconfig. Hi, just wanted to share this, MisterAddy has been doing some excellent mapping tutorials on LambdaGeneration, if anyone here is new to Hammer.